Anyone who knows me understands my grandchildren are a big part of my life. Whenever they come to visit, we are in turbo motion, leaping from one activity to another. My oldest grandchild, Brody, is a whiz at any sport he tries, such as golf, soccer or baseball, and we enjoy sports together. So I decided I needed to find something to have in common with my granddaughter, Emersyn. 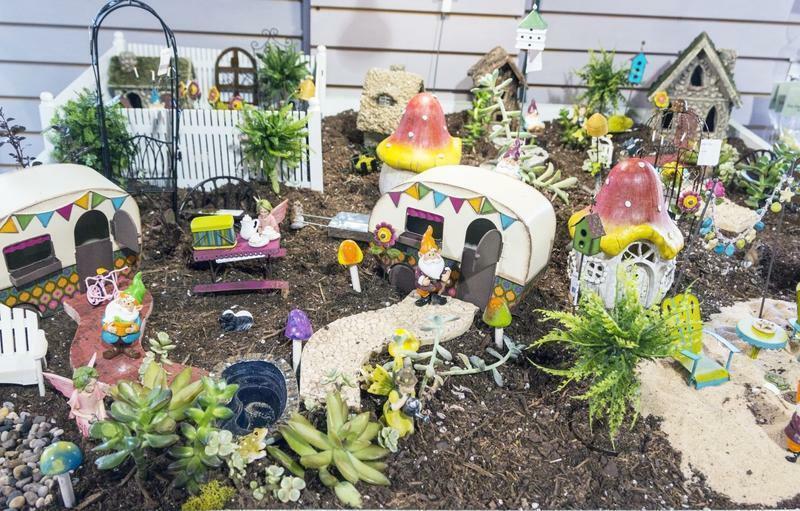 At the Master Gardener 10th anniversary Festival in the Garden celebration last fall, one vendor had miniature hobbit houses, wheelbarrows, mushrooms and other paraphernalia to decorate a person's yard for a fairy garden. I love it when a garden has a special place that grabs attention and surprises people as they walk around it. That surprise place in my garden would be the fairy garden that I share with my grandchildren. 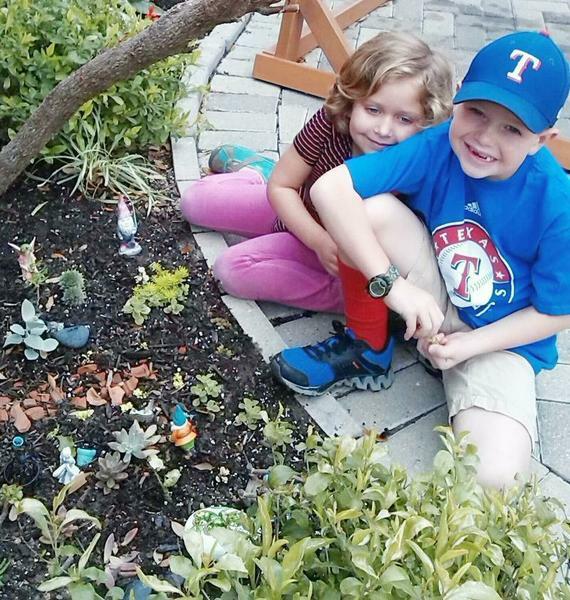 I also refer to my fairy garden as a leprechaun garden because of my Irish heritage. I first cleared a small area where a child could sit and arrange tiny items in a garden setting. I slowly purchased items that caught my eye, beginning with the leprechaun house. Brody, our builder in the family, built a fence around the house by using twigs from the garden and tying them together. Then, I hot-glued the fence into place for stability. Emersyn used colored glass discs to make a pond and river, to which she added a bridge. An old terra-cotta cracked pot sufficed as a walkway after I smashed it into pieces. Emersyn strung a small wind chime on the low hanging branch so "the fairies would have music." Lastly, I took succulents I had been growing in small pots and transplanted them around the fairy garden. Succulents are good to use in a fairy garden because of their usually small nature and variety of texture and color. They are easy to propagate, so I am able to use them to create tiny trees and bushes. To propagate this variety of plant, I cut enough from the parent plant so that I can have a little growth at the top and enough stem to dabble in root hormone and poke into the ground. Next, I dabble the stem in a root hormone because this helps to stimulate new growth. Finally, I take a pot with soil and create a small hole with the end of a paint brush, so I can feed the stem into the hole. Once I have potted my cutting, I water a little bit, being careful not to drown the cutting. Usually, I water about every other day because succulents grow better if the soil is not too wet. Succulents are grown in a nearby section of my landscape to be used in the fairy garden. They include a jade plant, a kalanchoe plant, tiny chartreuse-colored stonecrop plants, Vick's plant and a rosette succulent. As a gardener, I know any little piece of land can be turned into a bright spot with the right flowers. A fairy garden can be created in the same way. Use your imagination. 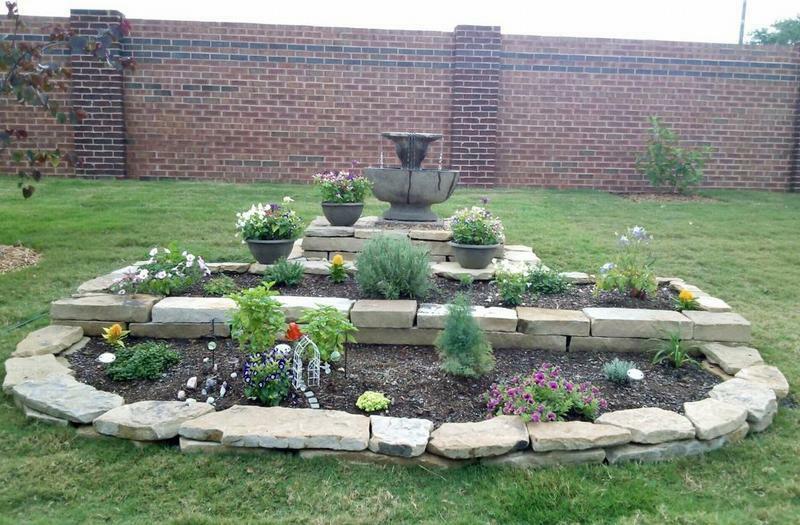 Walk through your yard and find the perfect location for your miniature garden. Or try using a large pot either right side up, or turn it upside down if it has a crack, and the fairies can come trotting out of the opening. 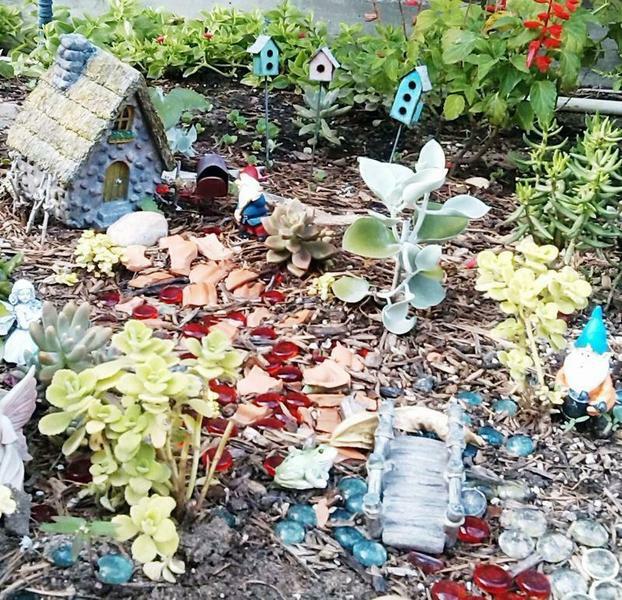 My neighbor took an old terrarium and created her small landscape. I've seen them done in an old wheelbarrow, child's wagon or a birdbath. Create a surprise setting in a more uniformly designed garden. 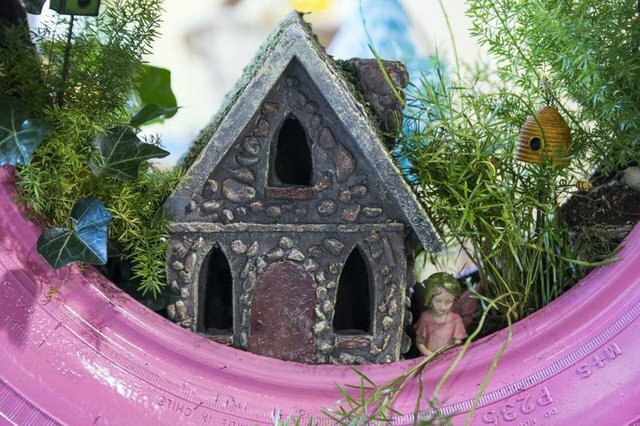 Take a look at the included photographs of an old tire painted pink with a garden in its wheel well found at Shop the World in Victoria, along with other items that could be used in your small landscape. The possibilities are endless. Now, whenever my grandkids do come, Emersyn and Brody enjoy sitting and playing with the small birdhouses, mailbox, bridge and leprechauns. While Brody likes to play with the leprechauns, Emersyn prefers the fairies, especially the pink one. I am looking forward to my newest grandchild, Maya, playing in this miniature fairy garden as well. • SUBJECT: Victoria County Master Gardener Lupe Cook presents "Cactus: Bringing the Desert to Your Garden."